CORNERS OF SANCTUARY, this U.S. metal band seems to enjoy creating metal music and does it from its heart. Since 2011 that they were formed they have already released 5 full length albums and actually “The Galloping Hordes” is number 5 of these releases. I always love the bands that sound old school, but in a very original way. No need to wear spandex and copy the 80’s IRON MAIDEN wardrobe to convince me that you are true. Nope, metal music is like the blues you need to put soul and love in it if you want to achieve something that is worth to be mentioned. All the rest is simply posing. So, CORNER OF SANCTUARY really have the soul and the passion and this is present in every composition on this album. The whole album sounds fresh and yet has this 80’s feeling that makes you think that it is a release that comes from that era. All the elements that made us love the U.S. metal sound exist here and as I said they come out very natural. The sound of CORNERS OF SANCTUARY obviously owes a lot to two of the great heavy metal bands and I mean JUDAS PRIEST (mainly) and IRON MAIDEN. I mean that the way they build their songs is influenced by the above mentioned groups. So, you will listen to compositions with nice melodic lines, galloping rhythms and catchy riffs with lyrics that you would enjoy to sing along. COORNERS OF SANCTUARY’s songs transmit to me a sweet nostalgia of the 80’s and yet they sound fresh. If I had to compare the group with some known metal bands, I would say that they have a sound closer to bands like ARMORED SAINT and ANVIL, but of course they do it in their own way. 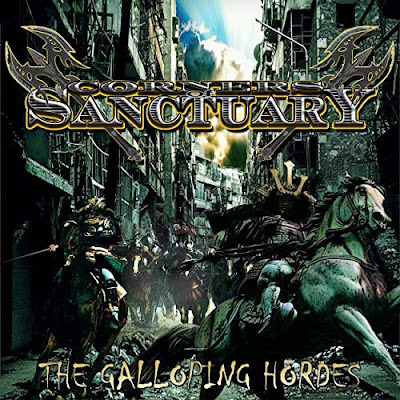 “The Galloping Hordes” is an album that breathes out heavy metal passion, it is well played and executed and because of that it is a release well done. It is actually an album that the more spins you give it in your CD player the more you will love it… Definitely a good choice for the fans of 80’s U.S. metal sound. Αναρτήθηκε από Nick Parastatidis στις 7:18 π.μ.